On these pages we are offerring you the opportunity to view and purchase wonderfully decorative glass and silver items made by renowned Jerusalem artist, Chaim Peretz. Chaim Peretz applies over twenty years of artistic skill to create unique and elegant stained glass and sterling silver Judaica pieces. 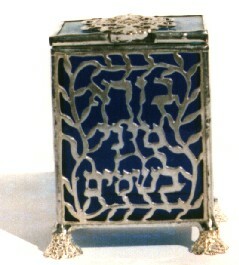 Please feel free to browse though this catalogue and view and purchase some of the fine Judaica created by Chaim Peretz. Chaim is available to produce specially commissioned works, including stained glass windows like the one on this page.